CHAMPIONSHIP WEEK RESULTS! 2018 comes to a close! Thread: CHAMPIONSHIP WEEK RESULTS! 2018 comes to a close! Well, while we wait for the playoffs to begin for our D-II teams, our league was busy already crowning a champion. And what a championship brawl it was. gr8ness97 and New School Mule faced off for the championship. gr8 trying to win his first title. NSM trying to win his second title in three years. gr8 trying to become the fourth-straight regular season champion and #1 seed to also win the tournament title. We only had our CLOSEST CHAMPIONSHIP MATCH-UP IN LEAGUE HISTORY! In our resident Toilet Bowl, which 08LB didn't set a lineup for so he's taking the "L" anyway, it didn't end up mattering. I got a big 46.05-point number from QB Eystin Salum, and 30 points from RB Jaleel McLaughlin, who I think may finish the regular season as D-II's national leading rusher? I'm guessing. Anyway, I got away with benching 34.2 points from WR Ju'An Williams. 08LB got 35.4 points from RB Al McKeller, and benched a huge 57.55-point performance from QB Tyrone Williams, but only got 3.25 points from his actual starting QB, Nick Rooney. We had some history here in our 5th-Place Match, as the #1 overall pick finally paid off for RC (lol). Gannon RB Marcus Jones set a new league scoring record with 84.3 points, the highest number ever by an individual player in our league. He ran for 410 yards and 7 TD's on the ground, and hauled in one pass for eight yards to lead the way for RC. Ian didn't really have a chance beyond that. He got 35.2 points from RB Xavier Turner, but got single-digit performances from two starters. We had quite the nailbiter in our consolation match-up! MM relied on a consistent performance across the board, getting a trio of 23+ point performances and weathering a DNP from one of his starters to land the victory. RB Eli Parks led the way with 29.8 points, followed by 28.3 points from WR Isaiah Manley. ship, who set his lineup, somehow, using last week's roster, took a DNP of his own in the starting lineup, but both of his benched RB's scored in single digits and wouldn't have changed the outcome, anyway. He got 43.8 points from QB Amir Hall, but couldn't overcome that DNP and a 2.1-point performance from another starter. Finally, in our championship, we lived up to expectations. gr8ness97 wins his first league title by winning our closest championship match in league history. gr8 got the victory by 1.7 points, narrowly beating out our previous-closest title match, when I beat Ian back in 2011 by 1.8 points. This match-up was more a battle of attrition than anything else. Both teams got lackluster performances from their usual-reliable quarterbacks. gr8 got only 19.25 points from QB Jayru Campbell. That opened the door for NSM, but he only got 14.4 points from QB Layton Rabb. gr8 got a big 44-point performance from RB Cameron Mayberry, but that was matched on the other side by NSM's RB Nelson Brown with 44.8 points! It came to the starters after that. Unfortunately for NSM, he only had one other player score over 20 points. gr8 got one more big performance. 38.2 points from RB Tyrell Freeman on Thursday. That was enough to make the difference and claim the title. As an aside, this was intense to score. When I do the scoring, I work from the top of the left column down, and then back up the right column. That means I scored gr8's team first, worked my way down to me, and then back up the other side to NSM. Nelson Brown was the last player I had to score of the entire thing. I saw his numbers in the box score, and thought for sure NSM was about to win it on the last player I scored, but it ended up being 1.7 points short. Craziness. 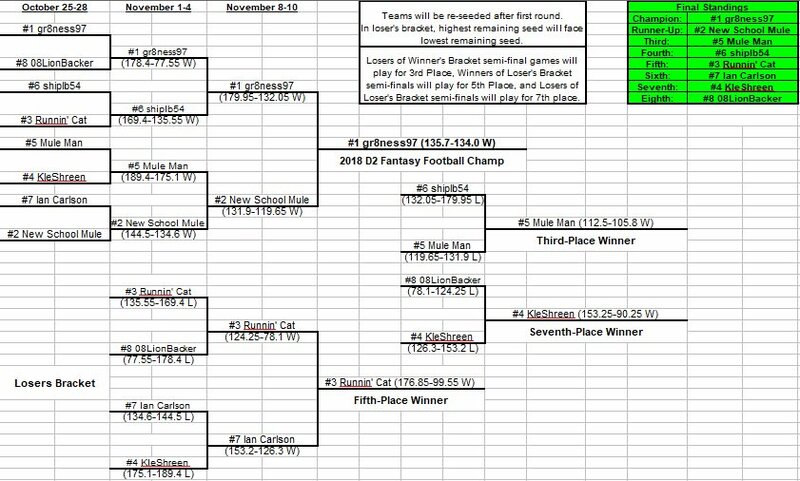 With all that said, we've had yet another successful year of D-II fantasy, the only one in alllllllllllll the world. Re: CHAMPIONSHIP WEEK RESULTS! 2018 comes to a close! And thank you Kyle for doing this again! See you all next year! 2013 Fantasy D2 Champion And Donor! This was a fun year indeed. Thank you Kle for running this again. Minor note: this is my second FF championship but first regular season championship. This year was a repeat of 2016’s championship game. Kyle, thanks for taking this on and making it such a fun part of the season. And congrats to gr8!